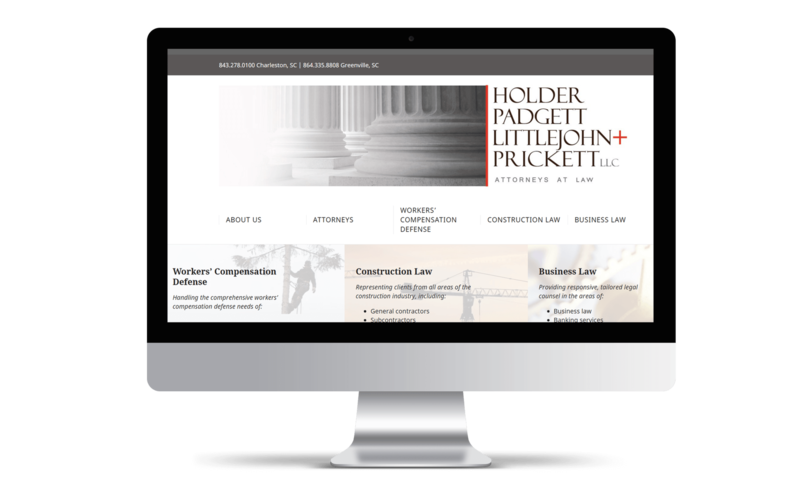 Holder, Padgett, Littlejohn & Prickett (HPLP) specializes in workers’ compensation defense, construction law, and business law. 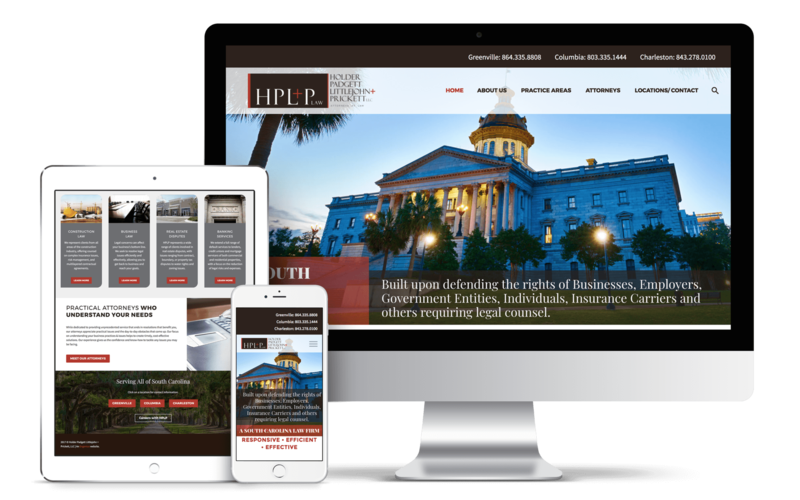 HPLP is highly relationship-based, efficient, and trustworthy, and they needed their website to demonstrate those qualities to potential clients. The firm came to us with concerns that their existing site was very text-heavy and lacked compelling visual elements. They were focused on scaling down some of the content on their site without watering down their message and making it more engaging and easy-to-navigate. Instill confidence in potential clients via a professional website that would be easy to use on every device. Although HPLP’s site was accessible on mobile devices prior to the redesign, it certainly wasn’t user-friendly. Studies have indicated that today’s savvy users have little patience for mobile sites that load slowly or make it difficult for them to find the information they’re seeking. With this in mind, we made sure that HPLP’s redesigned site would be easily navigable on all devices. We ensured that users could quickly find the information they needed and to foster a sense of trust and affinity among users for HPLP’s brand. In addition to ensuring that the site is mobile optimized, we modernized it from a design standpoint. 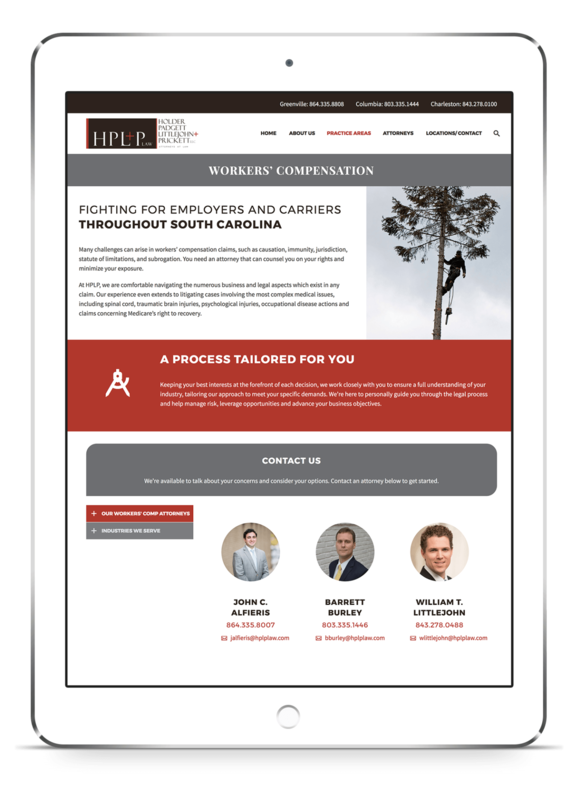 Eye-catching images and the use of the firm’s brand colors make the site much more visually appealing than the previous site, which was stark and contained mostly gray and white elements. Demonstrate HPLP’s expertise and validate the firm as a whole. We paid particular attention to structuring HPLP’s site in a way that really drew attention to the firm’s experience and capabilities. Right off the bat, users see information about HPLP’s focus: to provide timely and effective resolutions while remaining dedicated to excellent client service. Users are prompted to either learn more about the firm’s mission or to explore the site further, including dedicated landing pages for each of their practice areas. On these landing pages, we honed in on the target audience’s challenges and explained how the HPLP is able to help them overcome those challenges. For each practice area, we highlighted specific types of cases that the firm typically takes on, as well as types of businesses that they work well with. Providing this level of detail allowed us to effectively represent HPLP as a trusted and experienced firm without compromising any confidential information from past cases.